Heb kāshēer, Eng kosher, proper fit, sanctioned by Jewish law. Jewish dietary laws are contained in the Kasrut,. It explains which foods are permissible and which are prohibited. Further it explains how foods should be prepared. It is prohibited for Jews to eat shellfish, fish without fins and scales, shellfish, meat from animals that do not have cloven hooves or do not chew their cud such as eels, lobsters, rabbit, pork and camels. Rodents, insects without wings, and amphibians are prohibited. The Torah forbids birds of prey and scavengers. Meat must be prepared according to Jewish principals. Jews have their own meat marketz. It was prohibited for Christians sell Jewish meat in Spain during the Middle Ages. In Madrid one could be fined 12 mrs for buying kosher foods and if he did not pay he could be hung. In 1267 butcher from Salamanca was fined 5 mrs for selling Jewish meat. It was said that old Christians did not want this meat used for Jewish sacrifices and superstitions but Christians could and did buy Jewish meat. During the 15th C the Chaves family of Trujillo, Estremadura only brought Jewish meat as it was the best in town. They served it to Henry IV who stayed with them when in Trujillo. Rabbi’s were the Jewish slaughter men. They killed animals by slitting the throat as opposed to cutting the aorta, common in Christian slaughters. All the blood was drained out of the dead animal and then the animal was soaked in water to insure that no blood remained. When preparing the meat for consumption all fat and veins were removed and the nerve in the leg was discarded. This was not common in Christian preparations. Prepare the eggplant: Remove the stem and skin and cut thick slices (each about ½- ¼ “ thick). Gently simmer 8 minutes in water to cover. Drain. Set them aside. Finely grind almori ingredients together until they are well combined. 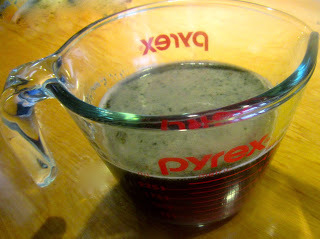 In a small bowl mix almorí with the vinegar. Pour the wine and water into the mixture and stir. Set aside. Heat the oil in a large pan over medium heat. Fry the garlic for about 2 minutes. Add the onion and continue to fry until the onion is golden, about 6 minutes. Remove the garlic and onion. Turn the heat to high. 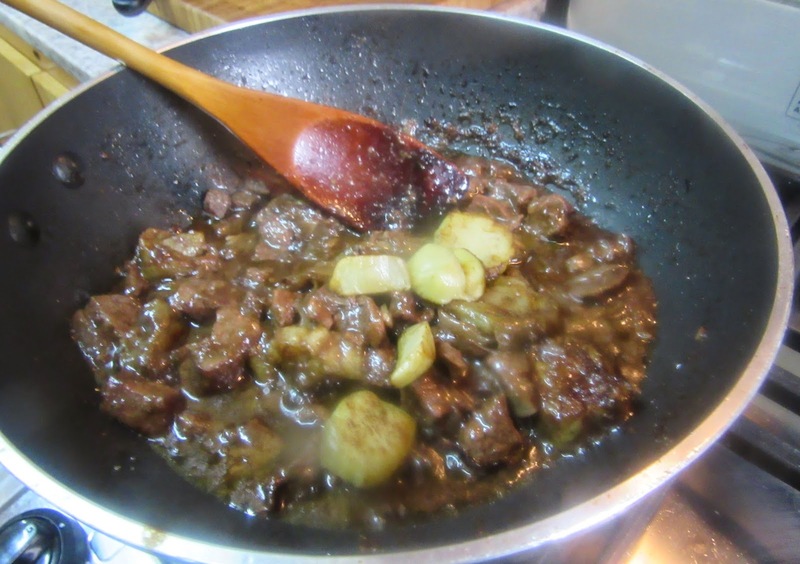 Place the beef in the pot and quickly stir-fry until just barely pink, about 3 minutes. Stir in the onion and garlic. Add the almorí-water mixture and stir again. There should be enough liquid to just barely cover the meat. Cover and bring to a boil, then turn down the heat and simmer very slowly for about 1 hour, or until the meat is tender. Meanwhile, in a large frying pan, heat the 3 tbsp olive oil over medium heat. Add the drained eggplant slices and fry them lightly golden, about 15 minutes, turning over or twice. You may have to do this in batches. 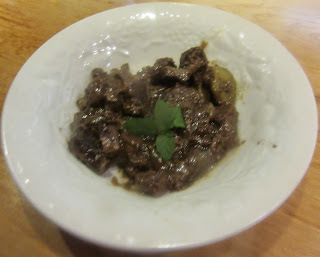 Add the eggplant slices to the stewing beef. Simmer another 15-20 minutes, covered, stirring occasionally, until most of the liquid has evaporated. Celery leaves were used as a substitute.